Luke Snyder Music: Find Out How Fast YOUR Hands Are! I just ran across this free WFD game today; its a great way to test yourself and see how fast your hands are! Basically, you alternate between tapping the "A" and "L" keys on your keyboard, exactly like playing a single stroke roll. The goal is to get the highest number of strokes that you can in one minute, with bonus points for playing cleanly. The game has five stages, with increasingly difficult opponents; you must play faster than the opponent to win! While you may question the correlation between hitting keys on the keyboard and playing with drumsticks on a drum pad, it actually feels surprisingly similar. Basically, this is just a test of your wrist strokes. 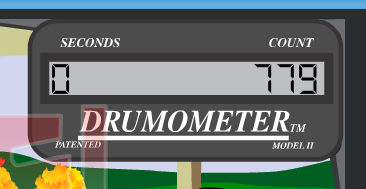 My numbers playing this game were almost identical to what I am able to perform with real sticks using wrist strokes. So there you go! 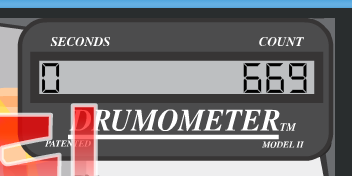 My best score was 815, which is a little bit over 200bpm 16th notes for the full duration of the minute. Woo! But what's that you say? You can do better? How high is YOUR best score? Best I managed was 738, all my attempts were pretty similar, lowest being 723. It hurts! ha! ha! Btw love your vids, keep up the good work man!